“Cookie’s Fortune” was a 1999 comedy by director Robert Altman. U2 had participated in previous soundtracks to Altman films, contributing by writing the song “Conversation from a Barstool” for 1993’s “Short Cuts” and contributing a remix of the song “Lemon” to 1994’s “Prêt-à-Porter”. 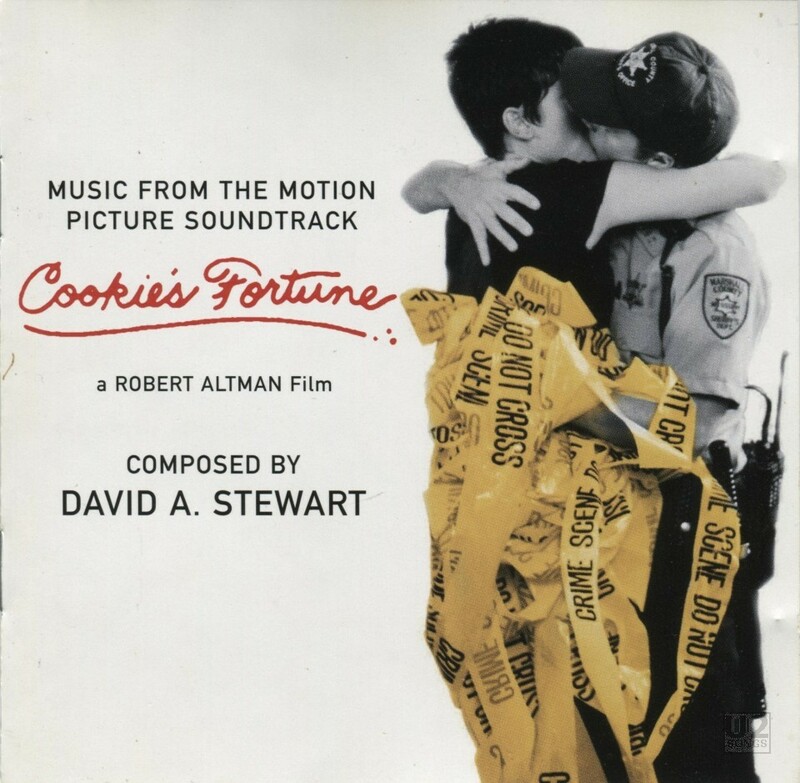 For the movie “Cookie’s Fortune” the entire soundtrack was composed by David A. Stewart, formerly of the Eurythmics. Stewart after the break up of the Eurthymics became more focused on production and writing, as well as musical work with other bands. Over the years he’s become a close friend to Bono and the two have often worked together on projects. Stewart described his friendship with Bono and the Edge: “We’ve known each other quite a while, and we’ve been in many sticky situations, predicaments, and glorious moments”. The first track on the album which includes U2 is a song called “A Good Man”. Bono is listed as performing backing vocals on this track. The other track on the album featuring U2 content is “Patrol Car Blues” which features the Edge playing guitar. Stewart wrote both tracks, and is involved in the performing of both tracks. In the liner notes for the album Stewart adds “special thanks to The Edge and Bono” among the thanks section. A single for the album, “Cookie” was released for promotion of the album. The b-side to that single was the song “A Good Man” which was the same as the album version. All tracks produced by David A. Stewart and Steve McLaughlan. Performed by David A Stewart: guitars, dobro, bass. Steve McLaughlan: programming, vocal sampling. Pat Seymour: Harmonium. Kenny Dickenson: Harmonium. Reece Gilmore: Drums and Programming. Caroline Dale: Cello. Candy Dulfer: Saxophone. The Edge: Guitar on “Patrol Car Blues”. Bono: Backing vocals on “A Good Man”. All tracks written by David A. Stewart.